Good Food and a New Friend: Happiness from a Child's Perspective - Donna L. Friess, Ph.D.
Greetings my friends! I have missed writing to you. Last week our nine year-old granddaughter began third grade in a much bigger, new school. I have been watching her adapt to this enormous change. Two of our older grandchildren are facing big changes as they prepare to leave home to go off to college. My husband, Ken, also began a new chapter in his life this summer by reentering the world of high school coaching. Life presents constant challenges. We cannot help but face the need to adapt to new situations as life catapults us forward. I have been thinking about you and hoping that you are taking the best care of yourself that you can. Emily will move into the dorms at USCD in two weeks! days in her new world, I asked all about it. I could not help but smile as she told me about the food and the many choices available and about her new friend, Ceiri. As our conversation continued, she added, "Ceiri is new too." I see that of all the possible reactions she could choose, she is focusing on the positives. I see her child's wisdom: good food and a new friend. After all, what more is happiness than appreciating our blessings, having something to look forward to, and finding new passions to wrap our brains around? I've had the "pedal to the metal" challenging my brain by writing a new book. 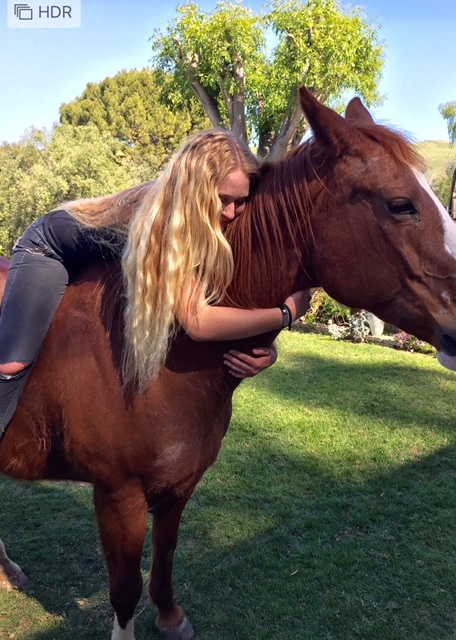 It is the horse story of our quaint town, San Juan Capistrano. I told you a bit about this last year. In early 2017, during my mission docent studies, I was electrified by a charming book describing the 19th century lives of the Mission San Juan Capistrano parishioners. The stories had been told to the resident priest, Father John O'Sullivan and published in 1930. The book, Capistrano Nights set fire to my imagination. A powerful urge overtook me. I knew that somehow I wanted to contribute something unique to the history of San Juan Capistrano, but I did not want to repeat what others had already written. I thought and thought until one day when I went to purchase grain for my horses and I discovered, to my chagrin, that the tack and feed store was closing down. The owner, Fred Love, a long-time cowboy and friend, was moving away, forever. He had stories to tell and they needed to be saved. San Juan is often called the "Horse Capital of the West Coast" or the "Horse Capital of Orange County." The community seems to have defied all odds and preserved its historic character and equestrian culture. How is that possible? That's when the idea struck me. If I hurried, I could gather up the lived experience of those involved with horses before their stories were lost. Perhaps, I could find the answer to the mystery as to how San Juan has remained a charming Western enclave while the rest of Southern California has succumbed to concrete, glass, and steel. Donna enjoyed researching and interviewing for her newest book. I felt like I'd heard a shot fired at the starting line! So that is why you haven't heard from me. I dug in deep, interviewing, researching, and writing. I learned so much. When I started the project, I had no idea that my studies would take me to a 190,000 year old horse fossil found in San Juan Capistrano! 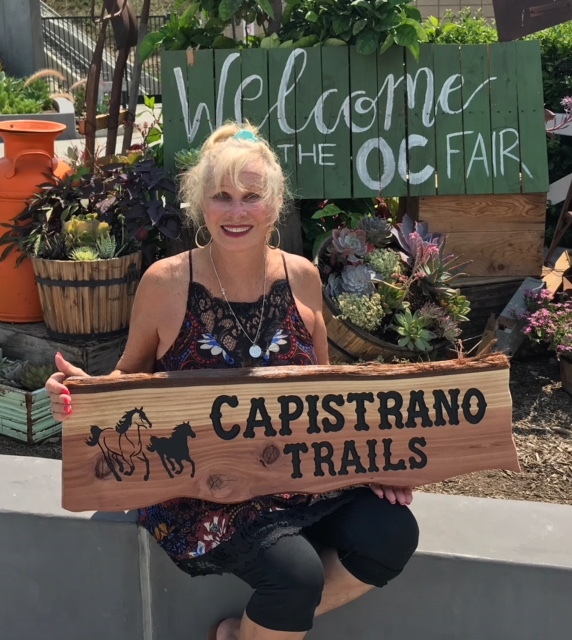 My book, Capistrano Trails: Ride for the Brand, takes the reader on a ride from the horse's Ice Age beginnings, through the Mission Periods, the Rancho Era, to the dynamic horse friendly place San Juan Capistrano is today; a place that cherishes its Old West heritage. If you are interested, it is available at Amazon.com in Kindle format, black and white print version, as well as hard-back color print. I hope you have had an enjoyable summer practicing mindfulness and taking the best care of yourself that you can. My hope is that as life thrusts you forward, you have been finding new satisfying ways of being. When I was a young mom with three active offspring and a full-time career, my grandmother shared advice with me that I have kept close to my heart. She always reminded me, "Donna, no one can take care of you, but yourself." Are you taking the best care of yourself? Are you resting enough, eating foods to support health, keeping your body fit, and being around people who inspire you to be your best self?